The Dominion is certainly a formidable opponent - it's hard to see how the Federation can win when they are so completely out-matched! The season finale for this was pretty devastating, but it is interesting that they changed the format of the show so much. My picks for this season aren't the strongest episodes I've seen from DS9, but there are a couple really great ones. 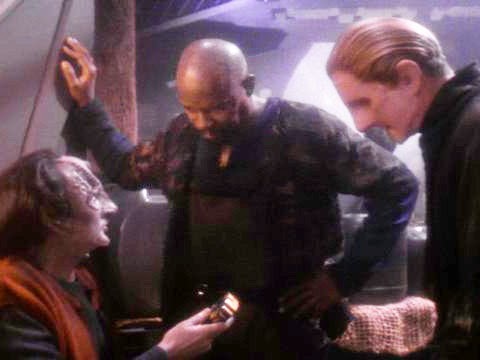 Odo, Sisko, Garak and Dax inexplicably find themselves in the bodies of Bajorans during the time of the Cardassian occupation. In addition to the interesting premise that these characters are somehow stuck in the past, this episode turned out to be an important character development for Odo, which showed a side of him that has never really come up before. Of course, I thought Odo did the best he could and should not have felt so guilty, but that is beside the point since the fact that he hides his feelings so much is a big turning point in the story, and made for great consistency and development for his character. When Keiko returns to the station, Miles finds that she's been taken over by an entity who uses her body as a hostage to get Miles to complete a mysterious mission for her. The tension between Miles and the entity was fantastic - I was on the edge with worry over how this storyline was going to go! A good old suspense story always appeals to me, so I really enjoyed how this one played out. Although in the end it seemed a little too easy to get the better of the entity. 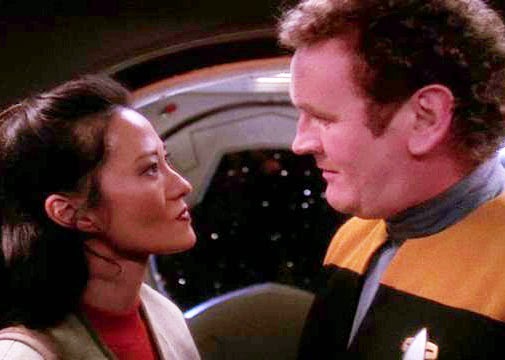 It was also great to see Keiko doing much more in an episode! 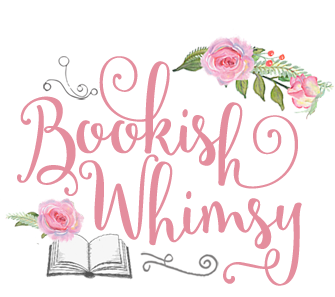 The Trouble with Tribbles from the original series meets with DS9 in this wonderful throwback episode! 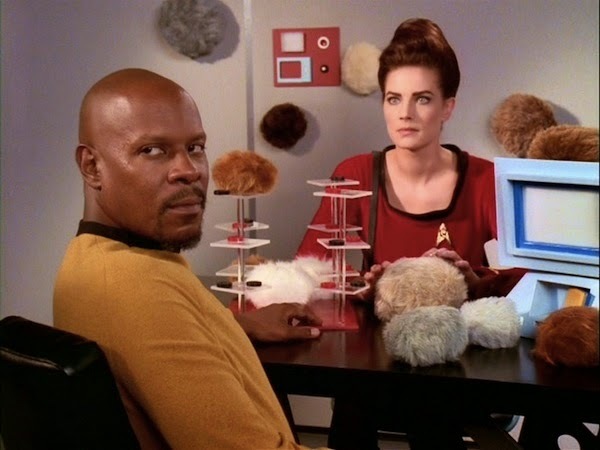 I had heard that DS9 did a tribbles episode, but I had no idea that they actually went back to the original episode and integrated it with this new storyline! This episode was an absolute delight, and the only reason it's ranked second is because there really is not much to the plot. It's clear this was a gimmicky episode, but I loved it. And it's so strange that I felt the DS9 crew looked so incongruous in the old 60s Star Trek setting. 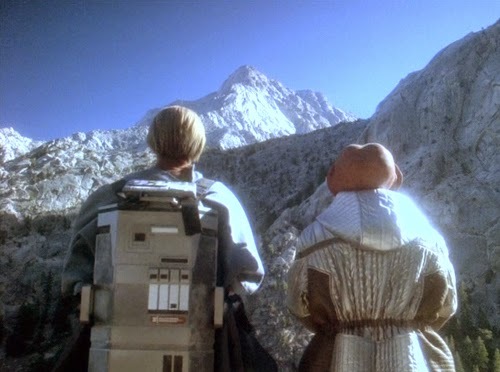 Odo and Quark are marooned on an uninhabited planet and must climb to the highest peak so their SOS has a chance of penetrating the planet's atmosphere. The dynamic of Odo and Quark - the best frenemies ever - made this a fantastic episode! They are at each other's throats, but they are determined to get the other one out of there alive. I loved every snarky, snarling, antagonistic moment of their interactions in this. And what a great side to see of Quark - and wonderful that he was the one to really save the day. It's interesting that even though these two have been through a lot in this episode, it really doesn't feel like their relationship needs to change because of it (you know how sometimes major things can happen between characters and the next episode it's back to the same old dynamic) so I felt like it was all just wonderful character development all around.